Students, friends and family used the hashtag #psulvgrad to have their content featured. Host accounts were used to control which posts appeared on the billboards, to prevent hashtag hijacking, and to cut off any inappropriate content. Tri Outdoor used Watchfire’s proprietary Ignite content management system to manage the campaign. Risky business? Not at all, according to Jason Wilson from Tri Outdoor. “This campaign really gave the local community the opportunity to be a part of Commencement with the students. It really made the public feel like they were a part of the commencement festivities,” Wilson explained. And did the campaign create the buzz the University was hoping for? 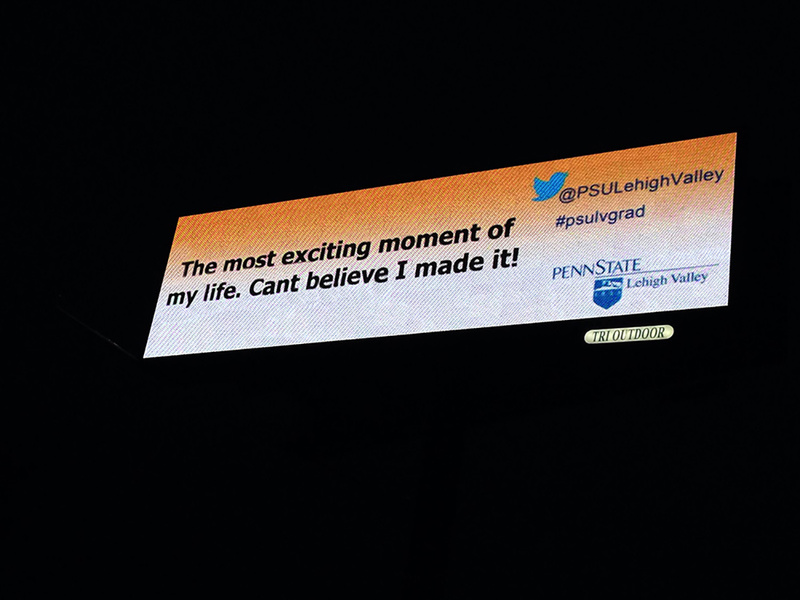 Kate Morgan, Director of University Relations says it did, "Utilizing the power of social media on the digital billboards was an exciting way to engage the Penn State Lehigh Valley community during the 2014 commencement season. The feedback from featured students, their friends and family was positive and genuine and the message was carried far and wide that not only is Penn State Lehigh Valley proud of its students and graduates, but we are a forward-thinking, community-minded university. Our followers jumped 10% during this campaign and the personal feedback was 100% positive. What a fantastic experience all around. Tri-Outdoor went beyond the call of duty to ensure success with this crazy idea and we could not be happier with the results!" Download free digital billboard artwork to help showcase dynamic content capability. Show your advertisers a few tricks with free dynamic content that uses time based counters or RSS feeds. We offer a new package for billboard operators each quarter.